While parts of the biennale were dedicated to exploring such ‘human interrelations’, others were explicitly dedicated to raising awareness about our relation with the natural environment. At the Art Gallery of New South Wales (AGNSW), the third major venue of the biennale, Hasan Sharif’s installation Objects (1985–2009) presented a series of sculptures made from consumer goods and discarded industrial elements the artist had found and collected in Dubai over the past three decades. Through its inventory of disparate objects, Sharif’s installation traced the cultural transformations that had taken place in the United Arab Emirates from its founding in the early 1970s to the present. Some of Sharif’s sculptures offered stunning re-arrangements of consumer and industrial products, while others produced a heavy-handed critique of consumer waste. Sharif’s Slippers and Wire (2009), a pile of thong factory cast-offs that was presented at the gallery exit, appeared as an overly pronounced final reminder of unsustainable practices. Meanwhile a range of artworks – from Phil Hasting’s Steadfast (2009) to Adam Cvijanovic’s The River (2012), Jorge Macchi’s Blue Planet (2003) and Guido Van der Werve Nummer Acht: everything is going to be alright (2007) – offered various ways to engage the aesthetics of climate change and finite water resources. 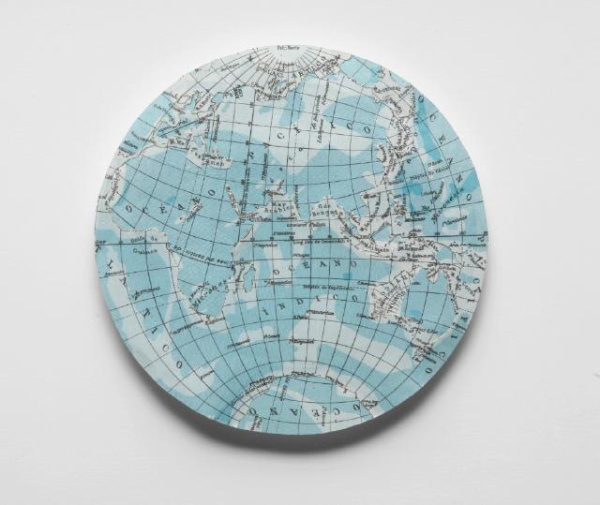 The most effective – and understated – of these was Macchi’s collage Blue Planet, which, like much of the artist’s work, takes the shape of a fictional atlas: this one shows a clumsily assembled image of a globe from which landmasses have been excised, though it still bears the outlines of the earth’s various continents and islands. Van der Werve’s large-scale single channel video installation Nummer Acht presented a captivating scenario: the artist walking on ice sheets in the Gulf of Bothnia, the northernmost part of the Baltic Sea, slowly trailed by an enormous icebreaker. But this work was ill-positioned in a corner of one of the galleries at AGNSW, in which the lighting needed to be turned down while the barely audible soundtrack – always crucial in Van der Werve’s work – needed to be turned up. Otherwise, Nummer Acht appeared to be, potentially, quite mesmerising. Since the 2008 edition of the biennial, the more ambitious, often large-scale works have usually been shown at Cockatoo Island, a Commonwealth Heritage site and former nineteenth-century prison and shipbuilding yard, located fifteen minutes away from Sydney’s iconic harbour.12 For the 2008 Biennale of Sydney, artistic director Carolyn Christov-Bakargiev exploited the oft-eerie ambience and large-scale architecture of the island and its historical buildings to produce some remarkable exhibitions.13 For instance, in one of the island’s decrepit buildings, strewn with buckets of the artist’s urine, Mike Parr installed his deeply unsettling site-specific work, Mirror/Arse (2008) comprising a series of video projections of Parr’s visceral performances from the 1970s onward. In another building, viewers could experience the exquisite site-specific video installations by William Kentridge I am not me, the horse is not mine and What will come (has already come) (both 2008). For the 2010 Biennale of Sydney artistic director David Elliot made similar good use of the island’s architecture, premiering Isaac Julien’s expansive nine-channel video installation Ten Thousand Waves (2010) in one of the island’s warehouses. Its multi-screen immersive environment transposed viewers into a volatile and deeply affective visual landscape of heterogenous images bound to Chinese history, mythology, identity and modernisation. To an extent, with regard to their curatorial choices for Cockatoo Island, de Zegher and McMaster showed a similar degree of sensitivity and ingenuity. Fujiko Nakaya was commissioned to produce one of her spectacular, ephemeral, fog installations, Living Chasm – Cockatoo Island (2012), which intermittently covered one of the island’s cliff faces, evoking the aesthetics of the Romantic sublime. And in the turbine hall of the island’s former shipyard, Peter Robinson installed an impressive large-scale polystyrene sculpture, Snow Ball Blind Time (2008), which through its lightness and materiality playfully inverted tropes of Minimalist art, in particular Richard Serra’s monumental Cor-Ten steel sculptures. But Nakaya and Robinson’s compelling installations did not make up for the plethora of dull works that dominated the remainder of Cockatoo Island. Some of the strongest works in the biennial were those that emphasised the singularity of particular subjective experiences – of migration and colonisation, for example – and refused to advance any simplistic notions of inclusion or ‘commonality’. At AGNSW, Bouchra Khalili’s eight-screen video installation, The Mapping Journey Project (2008–11), offered eight (looping) documentations of refugee journeys from Northern Africa and Afghanistan to Europe. Khalili’s aim was to draw an ‘alternative map of the Mediterranean’ which distorted normative cartographies and mapped clandestine journeys. Each screen presents an identical frame: a colour paper atlas focused on the Mediterranean and central Europe, and a man’s hand holding a black or red marker. Yet, they all have different audio tracks, played through headphones, in which a refugee verbalises the chronology and details of his particular journey. As the eight stories unfold, each hand traces a different itinerary over the identical background. Khalili’s work is essentially about the act of documenting minor histories, which are then offered to the viewer for witnessing. But this is not done on the assumption that the stories will find a common ground between the refugee subject and the viewer (as the curators would argue). Rather, like other effective works in the Biennale – such as Postcommodity’s Do You Remember When? (2009) – The Mapping Journey Project stresses the inherent modes of inequality that exist in a globalised, neo-liberal, society while calling on, though never assuming, the possibility of empathy or affinity. While the 18th Biennale of Sydney presented a range of intriguing and evocative artworks, it was blighted by deeply exaggerated claims about art’s capacity to mobilise social change. The curators (and some artists) relentlessly insisted that art can generate a set of ethical relations – such as empathy, inclusion or sustainability – through the symbolic gestures of weaving and sewing, or by engaging viewers in interactive and participatory works. Such a premise left much room for sceptics, such as myself, to question the seemingly simple and direct relationship between art (and aesthetics) and politics. Aesthetics, of course, plays a role in re-imagining or reconfiguring our conceptions of everyday life and politics, but this is different from claiming that the nexus of participation, interaction and art is implicitly that of a better, more democratic, world.